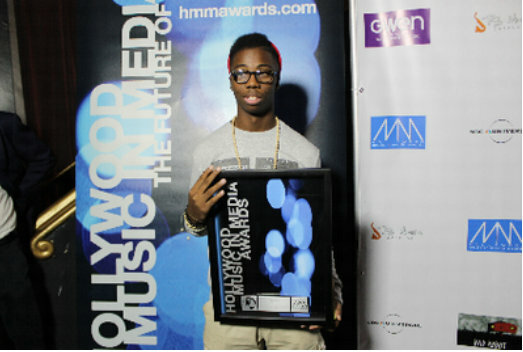 17 year old Bermudian artist Kidd Clazzic — aka Jahroy Richards — won the 2013 Hollywood Music in Media Award for Best Rap/Hip Hop for his single, “Fly Away” which features fellow young Bermudian artist Keke Roberts. The award was presented last night in Hollywood, CA in the legendary Fonda Theatre. CEO of PlayList Management, LLC Theresa Minors stated, “This is simply amazing! We are so proud of Kidd Clazzic and his accomplishment. To receive the award for his first single is just outstanding! The Hollywood Music in Media Awards [HMMA] is a live red-carpet style awards show honoring the music of visual mediums, the music of independent music artists, and the professionals responsible for placing music in visual mediums. The two-hour awards event features live music performances, award presentations, and celebrity appearances. This year, the celebrity host were Adam Gaynor, former Matchbox 20 member, Hollywood writer/director, Andy Fickman, and Golden Globe/Oscar Nominee, actor Eric Roberts.